In a large skillet, heat 2 tablespoons of the olive oil. Add the tomatoes, 1 garlic clove and 1/4 teaspoon of the crushed red pepper and season with salt. Cook the tomatoes over moderate heat, stirring occasionally, until just softened, (about 5 minutes). Scrape the tomatoes into a medium saucepan and discard the garlic clove. Wipe out the skillet. Repeat with the eggplant, zucchini, onions and red bell pepper, cooking each vegetable separately in 2 tablespoons of oil with 1 garlic clove, 1/4 teaspoon of crushed red pepper and a generous pinch of salt until just tender and lightly browned, about 7 minutes per vegetable. Add the cooked vegetables to the tomatoes in the saucepan. Add the bay leaf, 1/3 cup of water to the saucepan with the vegetables. Cover and cook over moderately low heat, stirring occasionally, until the vegetables are very tender, about 20 minutes. Discard the bay leaf. Season the ratatouille with salt and pepper and let cool slightly. Meanwhile, in a large nonstick skillet, heat the remaining 2 tablespoons of olive oil over moderate heat. Crack how many eggs you want into the skillet and fry until the whites are firm and the yolks are runny, 3 to 5 minutes. Transfer the eggs to a plate, season with salt and pepper and keep warm. 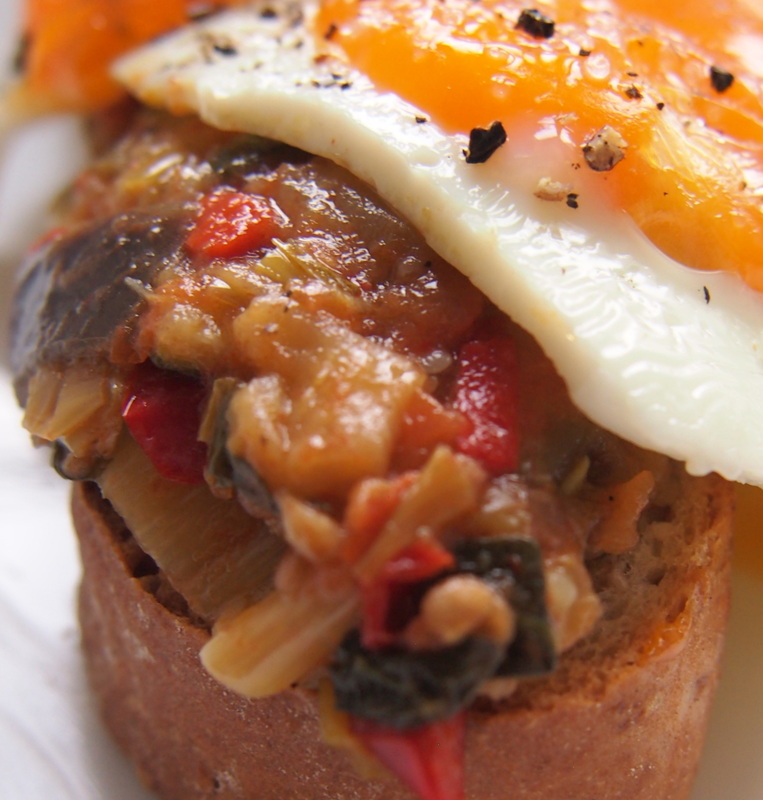 To serve, spoon the ratatouille onto the toasts and top with the eggs. Drizzle with olive oil, salt and black pepper and serve.